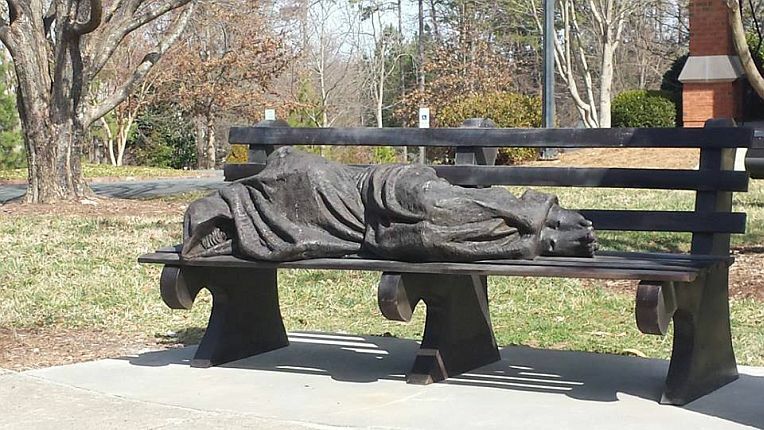 Some neighbors feel that it’s an insulting depiction of the son of God, and that what appears to be a hobo curled up on a bench demeans the neighborhood. It’s hard for us to recognize Jesus when Jesus shows up dressed as the poor or migrant workers from Honduras trying to seek asylum in this country. Scripture insists that experiencing God’s transforming grace in your life will lead to expressing God’s compassion in radical ways with everything that you have and everything that you are. Because of the essence of the Christian story. You see the very center of the Christian story, is the story of God becoming poor for us. Jesus himself would become hungry, thirsty, naked, and poor on a Roman cross for you, me, and the whole world. The gospel tells us that you and I, in all the ways that matter— spiritually and morally—are desperately impoverished and yet at infinite cost to himself, God gives us grace. God extends us compassion when we could not hope to deserve it. When that good news gets into the depth of who you are; when you are appropriately scandalized by the gospel of God’s grace, you will become the kind of person that naturally lives to extend compassion to everyone that you are around. Jesus says do you want to grow as my follower? Here is how you do it: get close to someone in need. When you are around the least of these, whenever you get near somebody who needs friendship, welcome, compassion, and help— whenever you make the choice to be generous—Jesus says you are on Holy Ground. Russian novelist Leo Tolstoy tells a fascinating story called Where Love, God Is. It is the story of a cobbler named Martin. Martin is someone who experienced deep tragedy. That tragedy grows him hard and cynical. He begins to be quite depressed. He drinks vodka like its water. But one day he happens upon a Bible and begins to read the Gospels. His life is turned upside down. Peace and joy flood his life. The next morning Martin wakes up excited that today he is going to meet Jesus Christ himself. He stationed himself by the window in his house early in the morning. Down the street comes an old man from his town named Stepanich who has shoes that are worn full of holes. He can’t pay to have his shoes repaired. And so, Martin simply invites him in from the cold. He repairs his shoes for him. He spends some time with an old man who’s who lives much of his life quite lonely. Then he sends him on his way. Later in the morning, he spots a woman who has a baby and she’s poorly dressed for the winter wind. So he invites her into his home. He gives her some of the cabbage soup that he had been making for his lunch. He gives her his cloak to wrap the baby in and then eventually he sends her on her way on her way. And then in the afternoon as he is again sitting by his window, he spots an old woman who’s selling apple’s out of a cart when a teenager sneaks up on her and steals an apple and tries to run off. But the old woman being spry, grabs a tuft of the boy’s hair and she’s screaming at him and threatening to call the police. So, Martin runs out of his home. He separates the woman from the boy. He calms the woman down. He pays her for her apple. He gives that apple to the boy. He makes the boy apologize to the old woman and he gets them to befriend one another. He goes back into his home and makes himself dinner. Then as he’s sitting by the fire, he remembers his dream and wonders where Jesus was and why Jesus did not come to visit him as he promised. And Martin understood that his dream did not deceive him; that the Savior really called upon him that day, and that he really received Him. Friends, this is the good news. Jesus has become the least of these for us. May we welcome him deeply into our lives. You will meet him in your life this week dressed as the least of these. This entry was posted in Uncategorized and tagged Christian service, grace, Homeless, Least of these. Bookmark the permalink.